Here is where you create, review, revise and print sales and rental orders. There are built-in lists for adding Customers, Inventory, Sites, and Notes. Just click to open the list, then click on any line in the list. You can check the availability of items ordered here. Queries, Estimates, Quotes, Orders, Voids, etc. all use this Editor. A transaction begun as a Quote can be changed to an Order (or Void, or any other status) at any time by clicking the Order Status button. The original Order Number is retained through the life of the transaction. 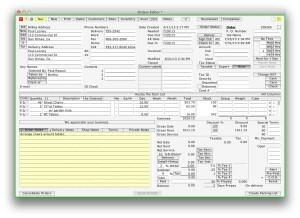 You can duplicate or reproduce existing orders. The Equipment Rental screen is shown above. There are similar screens for Party Rental, Sales and Services. 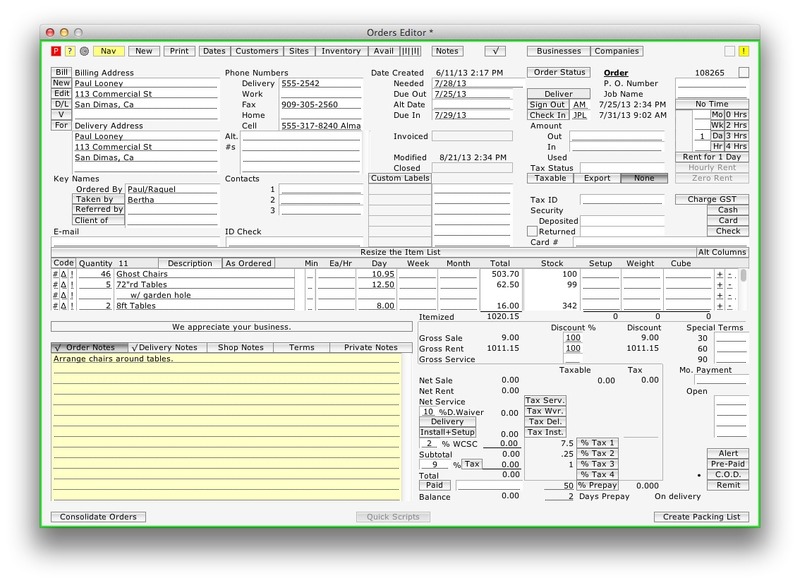 You can do sales, rental, and services from all Orders Editors.